The pretty city of Hanoi is located in the north of Vietnam and is one of the main destinations for visitors to the country. Offering a mixture of Eastern, Colonial and French styles, Hanoi is a fascinating place to explore and there are plenty of good places to drink, shop and dine here. 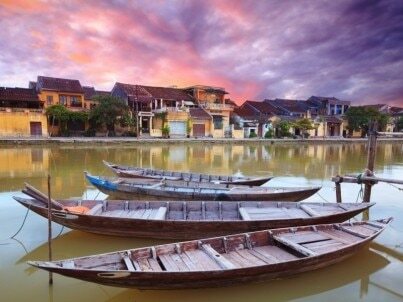 Hanoi is one of Vietnam's largest and most visited cites and there is a multicultural and traveler-friendly atmosphere. Although communicating can sometimes be a bit of a challenge, many people speak English and there are plenty of Western-style hotels, shops and restaurants available for those who want a taste of home. Hanoi is a real paradise for visitors who love to shop until they drop as the city features a large number of both day and night markets, where there are plenty of bargains to be found. When it comes to entertainment, Hanoi has plenty to offer. In addition to seeing the sights, visitors can take in a show at the theater, indulge in a spot of shopping or explore the parks. There are also outdoor pursuits available such as golf, swimming and cycling. Visitors to Hanoi will be able to spend several days taking in the sights as there are a wide range of different things to see and do including world famous museums, temples and parks. Food and eating are strongly ingrained in the culture of Vietnam, and this is particularly true in Hanoi, where there are a huge number of restaurants, cafés and other eateries to choose from.